There have been many spectacular, tragic, shocking and downright gruesome deaths in Hollywood films over the years, and this little compendium brings together 99 of the most memorable. In this new illustrated book the renowned Kobal Collection gathers the picture library's most famous cinema stills and presents them together in an entertaining format for the first time. Every cinematic era and genre features - from Hans Gruber's famous fall from the Nakatomi Plaza in 'Die Hard', to the Wicked Witch from the East being crushed by Dorothy's farmhouse in 'The Wizard of Oz'. Classic horror movie scenes such Marion Crane's shocking murder in the shower in 'Psycho' and the twins in 'The Shining' also feature. 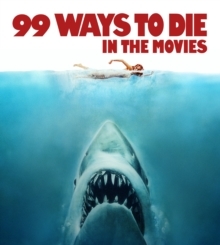 An excellent gift for cinephiles and fans of horror films alike, '99 Ways to Die in the Movies' captures iconic cinematic moments on the page.